For more than 20 years, Avanza Healthcare Strategies has been a leading advisor to ambulatory surgery centers and hospitals on areas including joint ventures, de novo facility development, facility conversions, acquisitions, migration of services to more appropriate settings, adding or re-engineering service lines and expanding markets. Hundreds of clients in nearly every state benefit from Avanza’s customized approach to helping them achieve their short- and long-term outpatient objectives. NSN Revenue Resources is your solution for strategic, intuitive, integrity-driven ASC revenue cycle management. By leveraging the diverse expertise of its staff, NSN offers a full scope of services. NSN’s leadership team understands the importance of optimizing revenue on every case and makes your goals their priority. STERIS offers complete SPD, OR and GI/Endoscopy solutions to help ambulatory surgery centers overcome the challenges of today’s health care environment, including available space and budget. Coupled with the support of staff training and education and 24/7 service, STERIS is the best choice to keep your ASC operating at peak performance. HSTpathways is a top-ranked, cloud-based Ambulatory Surgery Center software company dedicated to serving the ASC industry. HSTpathways provides the most trusted, enterprise software management solution available to the ASC industry. HST offers specialized software solutions to help ASC organizations achieve efficiencies with surgical scheduling, supply chain management, EHR clinical workflows, medical coding, insurance and patient billing, and accounts receivable collections. in2itive Business Solutions is a full-service revenue cycle management firm that operates within your existing EMR system to oversee every aspect of your billing and collections. For over a decade, their experienced team of dedicated professionals have been helping clients maximize reimbursements, lower A/R and increase net revenue by an average of 8%. MedVantage is a one source DME/DVT inventory company with diverse product availability and complete turnkey customer service. We are focused on sustainability and waste reduction while managing costs and liability for our partners. National Medical Billing Services is the premier revenue cycle outsourcing company focused strictly on ASCs and surgical practices. Our offerings also include time of service patient responsibility estimations, transcription services, cloud-based document storage, and outcomes tracking. Our unparalleled combination of ASC expertise, intelligent analytics, insightful advice, highly skilled and experienced surgical coders, and relentless attention to detail allow us to deliver exceptional, industry leading financial results for our clients. The Accreditation Association for Ambulatory Health Care, Inc. (AAAHC) drives quality improvement in ambulatory patient care through a voluntary, peer-based, and educational accreditation process. We provide facilities with relevant standards and education to apply to their patient care environment, and conduct a periodic onsite evaluation to assess compliance. BHG Patient Lending decreases your facility’s patient A/R balances and A/R days by offering your patients low-interest loans to cover their out-of-pocket healthcare expenses. BHG Patient Lending offers a hassle-free online application process, 100% patient approval programs, and pays your facility 100% of the patient responsibility within 72 hours. Capsa Healthcare - Securely store, dispense & track controlled medications and supplies with Capsa Healthcare. Featuring the new NexsysADC, the practical automated dispensing cabinet (ADC) to control access to narcotics and high-value meds – with a fast positive ROI. You’ll know exactly who is taking what dose for which patient at all times. Clorox Healthcare understands that safeguarding patient environments requires advanced and evolving solutions. With a broad range of innovative disinfectants like bleach, hydrogen peroxide, and enhanced UV technology, our comprehensive portfolio offers best-in-class solutions to help reduce HAI rates in your facility. For more information, visit www.CloroxHealthcare.com or follow @CloroxHealth on Twitter. The Core Group (Clinical Outcomes + Revenue Enhancement) is a new concept in healthcare innovation. We search the healthcare marketplace to bring healthcare practitioners the most innovative therapies to advance positive patient outcomes. All of our products also provide a practice benefit - whether attractive financials/reimbursement or improved office workflow. Echelon Medical Capital Capital is one of the largest dedicated accounts receivable finance companies in the US, delivering tens of millions of dollars in operating capital to doctors, hospitals, ASCs, diagnostic, pain and chiropractic centers. With innovative insurance and personal injury receivable finance options, and enormous capital availability, Echelon has the liquidity solution to maximize revenue for your practice. Learning Harbor provides online annual training for healthcare employees to meet regulatory requirements. The system is user friendly and reasonably priced, saving employer time and money for improved compliance. Set-up is quick with excellent client support. Records and summary data are available at all times. At M*Modal, our cloud-based clinical documentation solutions connect workflows for efficient and accurate medical speech recognition, medical transcription, CDI, and coding. We facilitate physician-patient relationships by making it easy for doctors to capture the patient story, and by delivering information when it is needed most – at the point of care. MedTrainer is the leading all in one compliance suite for healthcare organizations on the market. With a course library of over 150 eLearning courses and the capability of creating custom trainings, MedTrainer supports employee professional development, and allows organizations to maintain training compliance with regulatory bodies in the healthcare industry. In addition, MedTrainer offers modules for document management, including policy and procedure management, with eSignature capabilities, safety plan templates, and an advanced incident reporting system with custom form creation and escalation matrices. Another highlight of Med Trainer’s offering is the Safety Data Sheet library and binder, which allows employees to access safety data sheets at any time from their account. MedTrainer´s compliance suite has the tools healthcare organizations need to manage and maintain compliance and offers valuable tools for human resources and credentialing staff as well. Nixon Medical is the leading service provider of medical apparel and linens serving outpatient healthcare centers since 1967. From trusted laundry services to dedicated customer service, the management of your medical apparel and linens will thrive with us. Nixon Medical, All About Service, and we look forward to serving you! Pacira Pharmaceuticals, Inc. is a specialty pharmaceutical company dedicated to improving postsurgical outcomes. The company’s flagship product, EXPAREL® (bupivacaine liposome injectable suspension) utilizes DepoFoam®, a proprietary product delivery technology that encapsulates drugs and releases them over time. Learn more about Pacira, including the mission to reduce opioid overreliance, at www.pacira.com. At PDI we never forget who we are all working for. That’s why we offer a broad range of evidence-based, market leading Interventional Care, Environment of Care, and Patient Care solutions, all designed to help reduce preventable infections. It’s all part of our passion to Be The Difference®, every day. Radiation Detection Company offers high-quality radiation monitoring dosimeters, better known as x-ray badges, to the medical, dental, energy, education, and veterinary industries for 70 years. We offer competitive pricing and No Hidden Fees. Radiation Detection Company is accredited to NVLAP. Please visit our website at www.radetco.com. Surgical Notes is a healthcare IT solutions company dedicated to developing cutting-edge, innovative revenue cycle solutions, including transcription, coding, billing, and chart automation and document management, for the ambulatory surgery center industry. By assimilating Surgical Notes products and services, ASCs have access to an enterprise revenue cycle solution geared toward maximizing profitability, physician disbursements, and business office efficiency. ASCA’s annual winter seminars are geared toward ASC professionals seeking advanced content on ways to streamline their clinical and business operations, enhance their ASC’s bottom line and remain compliant with the ever-evolving regulatory criteria. Sponsors and exhibitors will have the chance to connect with attendees over the course of Thursday and Friday, utilizing tabletop displays. 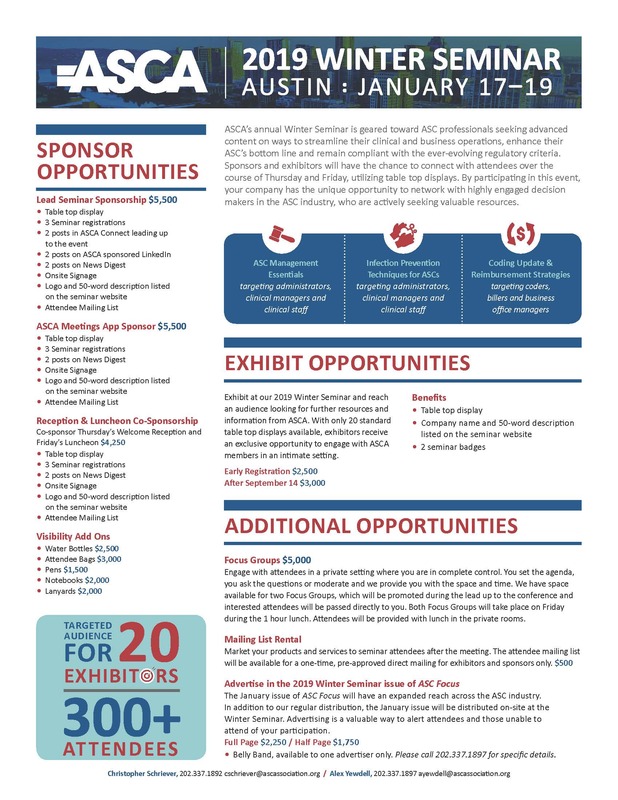 By participating in this event, your company has the unique opportunity to network with highly engaged decision makers in the ASC industry who are actively seeking valuable resources. For more information, please contact Alex Yewdell. Copyright © Ambulatory Surgery Center Association and the ASCA Foundation. All rights reserved.